This CD contains three tracks. Each track contains twelve low frequency sounds to balance the twelve acupuncture meridians in the following order - Heart, Small Intestine, Bladder, Kidney, Pericardium, Triple Heater, Gall Bladder, Liver, Lung, Large Intestine, Stomach and Spleen. The three tracks on this CD create a three week healing programme to balance the energies of the body. The best time to listen to this CD is just before going to bed. The use of headphones to listen to these tracks is not recommended. "I have found myself feeling amazing after listening to the Energy Balancing CD." "I completed the recommended 3 weeks program last week. At first I was disappointed hearing the sounds as I had expected something beautiful, then I surrendered and was amazed by its power. I sensed it helped me to draw imbalances out of my depths into my awareness for dealing with them and healing them. I also felt drawn to lots of sorting out, tidying, cleaning and letting go of the old that's no longer needed." "At times I found it really relaxing and had amazing deep sleeps after, and many dreams with themes and people from my past. During the latter part of the programme I found it so energising that I started listening to it earlier in the day." "My husband decided he wanted to do the 3 week programme as well and he did. We have been continuing listening to the CD since the 3 week programme completion and enjoyed it most of the days." "I have just completed the three week programme of the Energy Balancing CD and I have found that I am sleeping much better and have more energy." "My body loved the vibrations like it had been awaiting these sounds a life time. It was on the fourth sound that my body reacted strangely, like it needed to express a feeling and did so by jolting straight upright to fall back onto the mattress, jolted upright again and fell back, then jolted upright a third time...each time I heard my spine crackle and click." "The sounds ran up my spine, each time there was a strange crackle and clicking but oh so good, then I fell into a deep sleep, sleeping ever so well with no numbness in my hands during the night." "The following day I noticed my hip had righted, and area in my groin that had been giving me such a hard time, was gone, and the forever pain that had wrapped around my left ear and left side of my face was gone." "I also notice I get heaps more work done and feel less tired...and that after three night's of using the CD. I think your remarkable healing recordings are a brilliant gift to this world." "Our 10 year old son was having problems getting off to sleep. Since aquiring the Energy Balancing CD, we play it at bedtime every night and he is now asleep within minutes. We let it play on to the end of the track to complete his energy rebalancing." "I notice myself that the occasional restless legs that I would feel in the evening, seem to have disappeared." "I have been using the CD for two months to help clear my lungs and to relieve the asthma that I have been left with since having a bad case of bronchitis. During this time I felt no reason to use my inhaler which I am very happy about. I now feel so much lighter. I no longer have tightness in my chest and I can breath without feeling restricted. Thank you! Thank you!" "The first couple of times I used the CD I was conscious that my whole body needed balancing. The sounds absorbed into the body giving me a full balancing. The next morning I felt such a difference, my whole body was more energetic. Over time everything in my body felt like it was working better." "What I love about the CD is that I could use it at my own pace and leave a couple of days between each time I used it. This gave my body time to integrate the balancing/healing. This was very important as I found the sounds gave me a big shift in energy. I can now do things I wasn't able to do previously." "Thank you so much for creating this CD it has helped me so much." "I have used your energy balancing and chakra balancing CD's for the past few months, they are wonderful. My body really responds well to the sound." In Sanskrit, each chakra has its own bija mantra (seed sound) ; this is the sound of the element connected with the chakra. 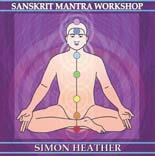 On this CD, Simon teaches you how to create these bija mantras. Each sound is sounded seven times using the harmonic scale. These sounds have a healing and balancing effect on the chakras and subtle bodies. Balance the chakras with seven vowel sounds. Using the harmonic scale found in nature Simon guides you on a sound journey through the chakras. Each vowel is sounded seven times as we go up the chakras and three times as we come down. "I'm enjoying toning along with your chakra CD." "I also have the Sounds of the Chakras CD which I am finding helpful as I am not very good at meditation on my own." This CD was recorded at a workshop in Canada and includes some of the exercises Simon teaches in his workshops. 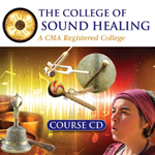 The CD is wonderful way to tune up your voice and energise your body. All the exercises are fun and easy to do. Exercises include Groaning and Toning, Laughing your way through the Body, Relaxing the Vocal Chords, Toning the Vowels, Scanning the Voice, and Toning the Major Scale. The CD finishes with two Native American Chants. "I find the sound exercises very energising and go well with the qiqong exercises I am doing at the same time. Thanks for your help." "We spoke on the phone in March when you were here in Sydney. I was the one with the vocal blocks, as you picked up on the phone. Because of this I was always reluctant to use the phone and preferred e-mail or writing, and my social life was hampered. For the past six weeks I've been practising the laughing segment on your CD about twice a week, each time practising it twice or three times in a row." "Guess what? I think the blocks are clearing. I'm finding I'm not hesitating to use the phone and I'm not blocking up at all. I'm a member of a couple of laughing clubs in Sydney, so that helped with the practice. I intend to keep up with the practice and see where it takes me." Chanting is part of every spiritual tradition. When we chant we connect ourselves to the divine power within us. When we chant with other people we will feel a deep connection with them. Chanting is very energising. Chanting these sacred chants has purifying effect on the body and the environment. Learn fifty-two sacred chants from all spiritual traditions. The words to the chants are included in a separate booklet. View track listing for this CD. Learn thirty six sacred chants from many different spiritual traditions. These chants are different from those on the first Sacred Chants CD. The words to the chants are included in a separate booklet. The Musical Intervals for healing the body, mind and spirit. Research has shown that when musical intervals were played to cancer cells, the cells were destroyed (see Article for full explanation). This track is best listened to through headphones. For more information on the Healing Power of Musical Intervals, please see the Intervals page. Alternatively, you can download just the Musical Intervals track, in MP3 format (256kbps, 30 megaBytes), by clicking on the "Download MP3 via PayPal" button below. "I wanted to share how I take your CD every where I go, I love sharing vocally with those I visit. You have no idea how wonderful it is to have another singing with absolute ease and happiness before they have a chance to say they cannot sing." "I like to leave a CD in their player if they have been full hearted with the joy gained through singing along as, I know they will enjoy the results that come with constant use as much as I do. I have one in my car and one in my home and use them daily, I am grateful for the ease and peace they bring to me and for the healing my body feels." This CD was recorded at a Sound Healing Workshop. 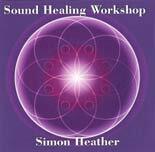 This CD was recorded at two Sound Healing Workshops. AND I CAN LET YOU KNOW WHAT THE POSTAGE COST WILL BE.